Never be caught in the dark again. Whether you’re out camping, travelling or just want an ultra-bright torchlight for emergencies at home, the hardy Komodo CREE LED Torch comes to your rescue! The versatile Komodo XP1200 CREE LED Torch is a must-have for any emergency situation at home or outdoors. With a brightness as powerful as 120 lumens, this torch can help you find your way down the stairs in case of a power failure or can help you find your way back to your campsite in the dark of the night when you’re outdoors. Best of all, it gives you 3 different modes of lighting – 100%, 50% and flashing, as the perfect solution no matter what the situation. With a sturdy anodised aluminium body that is shock resistant, the Komodo XP1200 CREE LED Torch is built to be your perfect companion on all your rugged adventures whether it’s hiking in the Outbacks or experimenting with some DIY projects in your backyard. CREE LED can be said to be light-years ahead in terms of energy efficiency, intensity and brightness of white light and lifespan as compared to normal incandescent bulbs. 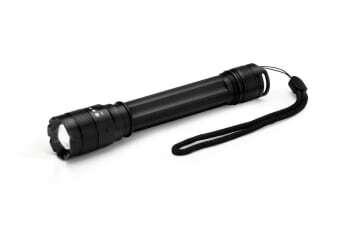 The CREE LED Torch, therefore, functions as a super reliable source of light that never lets you down!